It’s really a shame about summer being so hot. All of this wonderful produce available–my refrigerator is bursting at the bolts with our CSA veggies–and no desire to cook! The thought of turning a gas burner on makes me wince, and I’d rather just pretend I don’t own an oven. We’ve been getting particularly beautiful tomatoes from Red Fire Farm. I have a confession, though. I’m not a huge fan of raw tomatoes. I tend to eat around them. They get picked out of sandwiches halfway through and blatantly ignored in salads. I discovered that cooking them, even just slightly, makes a world of difference. I LOVE slightly cooked tomatoes! They are the perfect sandwich filler. And slightly cooked anything is good in this heat. This is a light, summery sandwich I made for lunch. It’s quick, easy, tasty, and takes advantage of the enormous amounts of summer tomatoes and basil we have at our disposal. I’ve spread the sourdough with Tofutti Better Than Cream Cheese, which is really one of the best vegan cheese products out there. Heat a skillet over medium heat with oil and herbs. Once hot, add tomatoes in one layer. Give the pan a little shake and flip the tomatoes about. Add salt. Once they are beginning to soften, but not falling apart, add a splash of balsamic vinegar while shaking the pan. Turn off heat. This process should only take a few minutes. 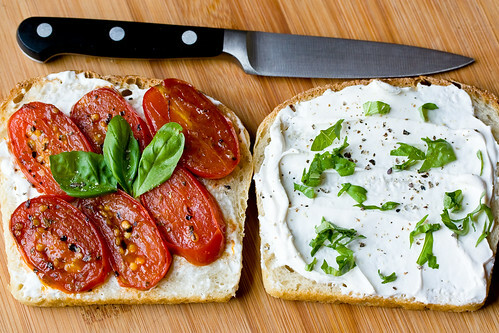 Spread your bread with tofutti, add chopped basil and pepper. Place tomatoes on top of that. Grill sandwich with a weight on top. 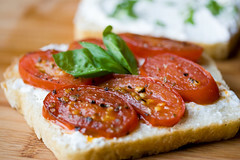 If you’re not grilling, simply toast the bread first, then add tofutti and tomatoes. Enjoy! I’m going to go clean out my freezer so I can crawl inside it. PS – I’m incredibly flattered to have been nominated in the 2007 VegNews Veggie Awards!! If you’re feeling so inclined, pop over and vote for me in the food blog category. Thanks!! That Tofutti cream cheese is so interesting! 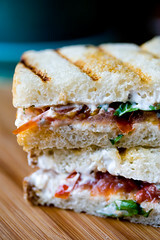 And this is a great idea – kind of like a vegan-friendly bruschetta in sandwich form! You always have great ideas! Could you substitute heirloom tomatoes for Roma, or no? Hillary, I think any kind of tomatoes would be wonderful! sounds like a great sandwich to enjoy not just in the summer, but anytime!! fantastic combination of flavors here. congrats on being nominated for a coveted Veggie Award!! good luck!! i reaaally want to try one of the slightly cooked tomato sandwiches. but i’m scared! raw tomatoes are my least favourite food in the world and even sundried tomatoes i can only handle in certain amounts. these do make me want to be brave… we’ll see ! That looks like a great sandwich. Good luck with the VeggieAwards! This weather is killing me too. Boston is too hot. I’ve got a huge CSA backlog as well because I just can’t bear to make anything around me hotter than it already is. The sandwich looks great though–maybe just the inspiration I need to make something rather than going out for falafel…again. I’m actually making tomato sandwiches today! The addition of basil is such a great idea and I have a ton of it in my garden right now. Question: is sourdough vegan? It should have buttermilk in it… ?? I have been constantly wondering about toffutti cream cheese…I am a little reluctant to buy it but I want to try it. Is it any good and does it taste close to cream cheese? My stomach can’t handle normal dairy. Your site is beautiful by the way. Lovely pictures. That sandwich sounds SOOO wonderful! I am going to have to make it very soon. Here’s a questions for you….I just bought a little pint of some Snap Peas, what would you make with them?? Oh, and I am really excited about your cookbook because your food always looks so good! Lovely sandwich, it is really making my mouth water! ah, i want one right now. this looks delicious! i think i know what i’ll be having for lunch tomorrow. and gorgeous pictures as always. This sandwich is a summer time winner! I love tomatoes anyway except dried. Seems like when they put the dried ones on a pizza they are hard when you get them. Maybe I would like them if they were cooked right. This sandwich looks fabulous. I’m going to go see if there are any quality tomcats in my fridge and possibly make it. I LOVE BETTER THAN CREAM CHEESE!! Have you tried grilling tomatoes? Those are good to, you do it outside, so the heat isn’t in the house (you could do it when you are doing some other veggies or tempeh) My husband love them grilled! Hi Lolo, I loved your sandwich! Wow, this looks good, kinda like the bruschetta…will surely try it! I dropped by on your site for the first time and would like to tell u that u have a nice blog here..good luck with your award nomination. Pls visit http://funnfud.blogspot.com for other veggie recipes and much more! Oh my, what a fabulous looking sandwich. While I do like raw tomatoes, I also like a semi-dried / cooked one too. Thanks for the suggestions. We can’t get the Tofutti produce here in Australia, but yesterday I read a recipe for a marinated tofu and cheese spread, that would go perfectly. Awesome just maybe I can move past the Panino and try this one:-) Looks absolutely delish! ah i no longer have to drool, went to my local earthfare and picked up some delish organic roma tomatoes, organic basil, a small sour dough loaf, and tofutti. ah, dinner tonight will be divine. isn’t good food freakin’ awesome? I totally voted for you. You have the best food blog EVER!!! And I cannot wait for your book to come out! I’ve never been able to stand eating raw tomatoes. I just recently managed to eat a raw bruschetta and only b/c the bread was so good. 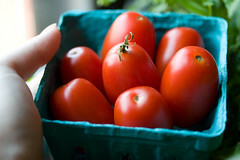 Cooked tomatoes are fine, but ick on the raw! I’ve always marveled at people’s cream cheese and tomato sandwiches; it never occurred to me to cook the tomatoes a little first! I’ll have to try it. September 12, 2007 - 10:34 am kendra! Tomato sammiches? Delicious. And yours look so expert. Did you take a page out of Pioneer Woman’s playbook? Hubs and I tried the Red Fire Farm CSA last year. I know what you mean about having your fill of veggies (read: we were in okra overwhelm!). September 13, 2007 - 1:27 pm Rick. While I am not vegan, this sandwich looks great. We crave the tomato basil soup from Corner Bakery (a chain in California…not sure if they’re everywhere). I shall certainly try this. Linked over here from BoingBoing for the knitted cupcakes. I love the tomato and basil combination. I will be trying this one. I would probably even add a dash of garlic when frying the tomato but then I love garlic with anything. Love your blog by the way. September 17, 2007 - 8:27 pm Amit R.
I made this last night along with your nearly raw tahini noodles, and it was amazing! I have a new favorite sandwich. Unfortunately, I couldn’t find sourdough bread in my neighborhood so I substituted a baguette, which was very, very good, but messy on the first try. For our second helpings (yes, it was that yummy), we didn’t cut the baguette all the way through, so the tomatoes didn’t slither out. Delicious! Just found your site today and my oh my, this sandwich was greatness. I happened to have every single ingredient already. This was simple and easy to make. Definitely one for the recipe box. I just discovered your website late last week, and have been drooling over all your recipes since! So today I tried this sandwich, and all I can say is, THANK YOU!!! It was soo good, and amazing, and spectacular!!! You’re brilliant! And I cant wait to try everything on this site! I just made this sandwich. half of it’s sitting in front of me. I just recently started to cut out meat and I have this application on my iphone, this recipe is extremely delicious. What exactly so you mean by Italian herbs?? What exactly do you mean by Italian herbs?? sushi without the sushi – I love the art in this. If a sandwich delivery business could only make this kind of effort….